Telling something about yourself is sometimes hard for people. I don't really think it's difficult at all. It's just hard to begin. That's why I'll start at the beginning. I was born on 28 September 1978 in Denekamp (Netherlands). At this time I am an ICT teachers assistent in secondairy school. I am working with students from 12 to 15 years of age. 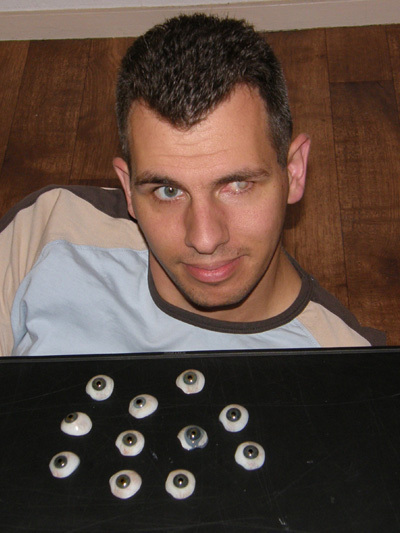 I created this site, because I wanted to get people acquintent with opportunities and, somtimes, the difficulties of being partially sighted. From the day that I was born I have been visually impared. It's an hereditary disease, that will go from mother to son. Before 1987 I was still able to see with two eyes. In August of 1987, the first day I went back to school after summer vacation, I started seeing weird colorful spots in my left eye. I had no idea what it was, so during lunch break I cycled home. During lunch I told my parents what I was experiencing. My mom promply called our regular eye doctor. She told us to get there as fast as possible. I was sent to the hospital in Nijmegen (NL). It appeared that the retina of my left eye had pealed off in some places. Because I had cycled home, it only got worse. I spent a week in the hospital. After the operation the eye just wouldn't heal itself. 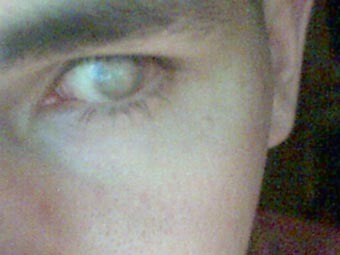 What had been my beter eye, had now become nearly blind, seeing only 5%. Two years later I had three operations within a years time. The first one was because I had cataract on my left eye, a few weeks later I got secondairy cataract (or after-cataract). And if that wasn't enough, I got an eye infection for desert. Before they wanted to do an operation on the infection, they decided it might help to give me an eye injection. Yes, you are reading this right. Since you might have a grim grin, I probably won't have to tell you that it HURTS. And because it didn't work, I got a fourth operation at the beginning of 1990 for free. After these operations you weren't able to see the pupil and the iris anymore, as you can see on the photograph down below. 1991. My left eye is totally blind. But suddenly I see something familiar: colored spots. This time in my right eye. Again as quickly as possible to the eye docter. And again the retina had pealed off. Luckily it was in a beginning stage. At first they didn't want to operate, because it hadn't gone far enough. But not much later they decided that it would be better to operate anyhow. After the operation I was very curious. Would I be able to see, or not. There was a chance I'd be completely blind. But I could see! At that time I was the luckiest man on earth... or was I? When they took off the eye patch, I could see. But it was like I was laying on the bottom of a glass of whisky and someone just stirred it. The first thing I did was alarm the surgeon. Their opion? That's how you will be seeing from now on. Only when they performed a routine check, they discovered a hole in the retina! All hopes of ever seeing again were gone. It's like the ground under me just disappeared. I thought I was going blind for sure now. I can still remember everyting when they brought me to the operation room. The surgeon said: "Oh, he's almost asleep.' I turned my head towards him and said: "No way!". Even the scent I can recall. Sometimes when I enter a building and smell that scent, I get a little nervous. Isn't it strange you can remember exact details when something major important happens. Even scent. After the operation everything was "good" again. Eventually I could see only 15% with my right eye. Ever since that operation everything stayed stable. But sometimes people look startled at my left eye. In 1997 we learned that there was a way to sort of tattoo your eye. We inquired more information in the hospital of Rotterdam. It would take 6 short operations. But during the inquiry an alternative was suggested. It would only take one operation. I could get a prosthesis; a glass eye in front of my real eye. I chose to have a glass eye, because I wanted to keep my eye the way it was. Because the operation sounded really interesting, I decided to stay awake during the operation. It's really amazing to witness something like an operation. During the time I had all the operations I never had to reattend a whole school year. I have always attended regual schools and no special schools for people with sight problems. When I was in kindergarten they wanted me to attend such a school. My parents wouldn't let them do that so I stayed in a normal school. I am very greatful that they did. I'm glad I grew up with "normal" people. I never made it a secret I was partially sighted. I've always been open about it and good sighted people really accept it. I learned that if you are open about it, people will talk to you easier and question you about it. If you make it a secret people won't understand you and you get pushed in a corner. People think you're pitable. And I've been in that corner during secondairy school. I was distant to everyone. This was also because kids were bullying me in ground school. It took me a long time to get out of the corner. For me 1997 was an important year. I have a feeling that getting the glass eye helped me cross an invisible border to accepting my handicap. I became more self assured. And it was alway fun to "pop" out the eye unexpectedly. The kids at school are dealing well with me being partially sighted. At the beginning of each school year I introduce myself to the new kids; in MY OWN way. By this I mean with lots of humour. 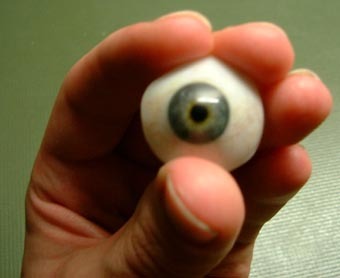 I also bring a spare eye to class, so everyone can see what it looks like. There's always lots of "Oohs" and "Aaahs", but the kids accept it immediatly. They sometimes even forget me being partially sighted, but that's good I think. Besides working at a school I am a voluteer at a nature historical museum and also an astronomical observatory. At the observatory I give guided tours and am helping out with astronomy courses. I'm also an amature photographer. Mainly I take pictures of things in nature, the weather and of course astronomy. Please take a look in my photoalbum. I hope I haven't bored you too much with this story. As you can see, it's not hard at all to tell something about yourself. If you start at the beginning, you will find it difficult to put an end to it. I wouldn't want anyone to become partially sighted, but I'm okay with it. I don't SEE it as being a handicap. I may have some disadvanteges or small problems, but I always look towards positivity and possibilities. I will try anyting. If you don't try it, you won't know if it's possible. And if something isn't possible? I'll just throw it far away, so I won't see it anymore.